"Central Asia’s rich hydrocarbon and uranium resources could serve the needs of a rapidly industrializing India’s economy and nuclear-energy program." Central Asia is now comprised of five republics: Kazakhstan, Kyrgyzstan, Tajikistan, Turkmenistan and Uzbekistan (sometimes collectively referred to as “the Stans”). Two decades have passed since these countries became independent, following the collapse of the Soviet Union. Yet it was only a little over a year ago, on June 12, 2012, that the Indian Government announced its “Connect Central Asia” Policy; the Minister of State for External Affairs, Shri E. Ahamed, gave a keynote address at the First India-Central Asia Dialogue, held in Bishkek, the capital of Kyrgyzstan. He stressed the importance of “strategic and security cooperation,” focusing on military training, joint research and counterterrorism coordination, and, most significantly on Afghanistan’s peace and stability — a country that borders on Central Asia to the north and Pakistan to its east. It is a theme that is repeated often in the Indian Prime Minister’s comments and in many of the Indian Defence Department’s Annual Reports. It must be stressed, however, that while Afghanistan is of crucial importance (in part because of its location), we cannot fully comprehend the relevance of India’s strategic and security interests in Central Asia unless we examine their economic and political foundations. It may be instructive to recall that, as part of the Soviet Union soon after the revolution in 1917, these republics had been isolated from all neighboring countries. Even today, Russia sees the “Stans” as its “backyard” (much as the U.S. has viewed Central and South America). But soon after their independence in 1991, China began to cultivate ever more close relations with the former Soviet republics. That was more than 20 years before India announced its formal interest in the region. Nor did Western corporate interests lose any time in their efforts to explore and exploit the region’s oil and gas resources. As noted in an earlier post last year, Central Asia’s rich hydrocarbon (and uranium) resources could without doubt serve crucial economic needs of a rapidly industrializing India (as well as the country’s nuclear power program). In turn, this country of over a billion people can be a lucrative market for the five developing countries of Central Asia. Moreover, many of them also hope that India could help them to limit the influence and spread of Islamic extremists in the region who have been quite troublesome at times. It is a concern New Delhi shares inasmuch as its own security is at stake (and will be even more so once the U.S withdraws most of its forces from Afghanistan in 2014). Also problematic for both sides (though far more so for the five states) is the trafficking in drugs and arms. Finally, the “Stans” can be good markets for Indian goods and services — though Delhi lags far behind Beijing in exploiting this demand. India is clearly better equipped financially and technologically than Central Asia to take advantage of these opportunities. But enormous political, economic and physical hindrances block access to these resources. British India had long dreamt of going up the Indus River, (pp. 132-33) once its navigability had been established, and from there to the Old Silk Road, carrying goods that could be sold not only in Central Asia but also in Chinese and other Asian markets. But in post-independence, divided India, that route is now a part of Pakistan, with whom India has fought three wars since Independence, and with whom relations remain problematic on the whole, with hopes sometimes rising, sometimes waning. For the same reason, India has lost the common border it once shared with land-locked Afghanistan — which now abuts on three of the five “Stans” (also land-locked). These offer India an excellent entry point to the region. But Pakistan refuses to let India access Afghanistan through its territory. For Islamabad, Afghanistan provides strategic depth — i.e., an area in which they can fall back on and regroup in the event of a successful Indian onslaught. Therefore, the Pakistanis are already apprehensive about India’s growing presence and influence in the country and hence would be loath to open up a route to Kabul through their territory. Lacking access to Central Asia’s resources by land, India has been considering a sea route to the Iranian port of Chabahar and thence to Afghanistan and Central Asia. Cargo could ship from the port of Mumbai, arriving in Chabahar in less than 4 days. The importance of Chabahar, in particular its geostrategic location, can hardly be over-emphasized. It is rather close to the Pakistani Port of Gwadar, whose building China financed for the most part and which it still runs. Since use of this Pakistani port is out of the question for India, Chabahar remains the only port facility that India can use to access Afghanistan and Central Asia. As such, it not only circumvents Pakistan’s impeding role, but somewhat improves India’s geostrategic standing vis-a-vis China, in this instance. Hence, New Delhi has invested a good deal of effort and funds to develop this port, along with roads and a bridge in Iran that will connect this port to a city on the Afghan border. The connection has already been completed to the Afghan city of Zaranj. Equally important has been the development of the latter’s weak transport sector. However, India’s contribution has merely supplemented extensive investments made by the U.S. in road building during its extended presence in Afghanistan. Ultimately, of course, India’s main purpose is to secure access to Central Asia’s resources. Hence, it has made additional road-building efforts to connect Afghanistan with various Central Asian countries. It goes without saying, then, that India has a stake in the peace and stability of post-2014 Afghanistan (something it shares with the U.S. — and indeed with China and Russia). Should the situation in Afghanistan stabilize, India would be able to satisfy some of its growing needs for oil and gas from Kazakhstan, Turkmenistan and Uzbekistan. Of course, acting on this is easier than it sounds: India is not the only country that is looking to supplement its energy needs from Central Asia — an area far more stable compared with the Middle East where most of its needs are met at present (and which therefore compels it to look elsewhere). China is the biggest competitor for these resources, and Beijing has made huge progress in establishing means of accessing these (under agreements with the countries involved), whether through oil and/or gas pipelines or through traditional road and rail links. China is also clearly concerned about Indian competition in Central Asia. 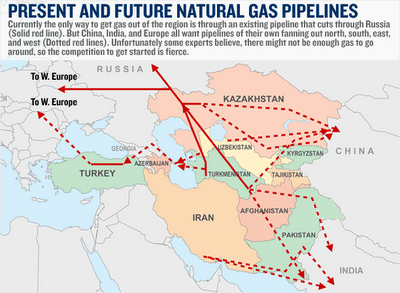 As pointed out recently in a news report, energy security is all of Asia’s “Achilles Heel.” The world’s major consumers of Central Asia’s and Middle Eastern energy sources are to be found in South and East Asia, with China and India being the most voracious patrons. For they are both becoming industrialized, and as their expanding middle classes acquire greater wealth, they are seeking the “better things in life,” including more expensive foods, as well as means of communication and transportation. In turn, businesses and/or governments throughout the region are drawn towards the production and/or purchase of these things. This trend is bound to accelerate as their populations continue to grow (even as those of the West decline). This may only sharpen competition and conflicts — especially among the buyers and sellers, as well as between these covetous clients (viz. some worried countries — e.g., Japan, the Philippines and others — challenging China’s claims to the South China Sea, valued not only for its sea lanes but also its oil and gas resources). It should also be mentioned that the region might also appeal to India eventually as a potential route for accessing the European market. India has long endured trade deficits, worldwide and with the EU, one of its main trading partners. The reason cited by one observer is its “low exports base and high imports of coal and oil for its energy needs.” In 2012-2013, India had a negative balance of trade with all of its energy providers, starting with the United Arab Emirates (UAE) (the top seller), and followed by Saudi Arabia, Iraq, Indonesia, Kuwait, and Qatar. But most of its largest trading partners do not provide oil or gas. Rather, there is an exchange of more traditional goods. Yet even with most of them, it has a trade deficit, the largest being China (surpassing even that of the UAE), followed by its European trading partners — Switzerland, Germany, Belgium, and a couple of Asian states — Japan, and South Korea. In other words, a trade deficit was registered in this period with as many as 13 of its top 15 trading partners. It appears that, once New Delhi decided on its “Connect Central Asia” policy, it took steps not only to accomplish such a connection via Iran and Afghanistan, but also to join long-standing efforts by national and international actors that would link Asia with Europe. One such effort is the Trans Asia Railway network, shown here on a map and described more fully elsewhere, that will connect the Pacific coast of Asia to Europe through 28 countries. It is a project undertaken in 2006 by the United Nations’ Economic and Social Commission for Asia and the Pacific. This rail network, together with the Asian Highway project, is part of the ambitious Asian Land Transport Infrastructure project endorsed in 1992 and agreed to by India which also includes “the facilitation of land transport.” Some estimates fix the date of completion as 2025 (probably a bit too optimistic). What all of this tells us is that India has begun looking ahead with more diligence and commitment than it has shown in the past to projects that will enhance its trade options and national goals. In the meantime, it is focused on the main obstacle in its current efforts to expand cooperation and trade with Iran, and through Iran, with Afghanistan and Central Asia, as already noted. But this hope is dampened by America’s concern with Iran’s nuclear program, which has led to onerous sanctions since early 2012, not only on Iran but also on those (like India) wishing to do business with Iran. Under pushback from New Delhi, Washington has made a partial exception for India, recognizing the country’s need for Iranian oil. Hence, rather than terminating oil imports, India has merely reduced them. However, the sanctions remain onerous for India who can only hope that the recent agreement in Geneva will ultimately lead to the resolution of the U.S.-Iranian conflict. In the meantime, New Delhi is having to walk a tightrope in its dealings with Iran. But work on this immensely strategic port continues, and now Afghanistan has expressed interest in signing a trilateral agreement with Iran and India on Chabahar for facilitating the transit of commodities to Afghanistan. Thus, despite the sanctions and the climate of opposition in the American Congress and among some U.S. allies which have placed resolution of the conflict in jeopardy, India has had no choice but to pursue its economic and political interests through whatever means are available, and through these, secure its strategic and security interests. We are at a pivotal and perilous point in history, as the political gravamen of international politics hangs between West and East in the early 21st century, and China competes with India for influence and power in this crucial Asian arena. Surely, the direction in which India chooses to go at this critical period may yet determine the geopolitics of the future. Mary C. Carras, professor emerita, Rutgers University, is an analyst of Indo-American relations. Her writings include a political biography of Prime Minister Indira Gandhi and a study of Indian political factions.